The Arab region comprises one of the largest deserts in the world, covering an area of 2,330,000 square kilometers and making up around 18 percent of the total surface area of the Arab region, while forest areas cover only 6.6 percent of the total surface area . The total population of the region exceeded 414 million in 2017, an increase of almost 46 percent from 2000, with the urban population representing 59 percent of the total population in 2015. The rapidly growing population and high urbanization rates exert increasing pressures on the available natural resources and on the sustainability and quality of the environment of the cities in the Arab countries . The region is characterized by an arid and semi-arid climate. Average annual precipitation varies from the extremely arid weather in Bahrain, Qatar, and the United Arab Emirates at precipitation lower than 100 million cubic meters for 2014 to Sudan and Algeria where precipitation exceeded 200 million cubic meters for the same year . Extreme weather is currently more frequent in the Arab region, characterized by extreme temperatures and shorter but more intense precipitation periods. One of the highest temperatures recorded in history was in Kuwait in July 2016 at 54 degrees Celsius. The highest water stress in the world was recorded in Egypt in 2012 at 127 percent, with 5 out of the 10 highest water-stressed countries originating from the Arab region, namely Algeria, Morocco, Sudan, and Tunisia, in addition to Egypt . Water scarcity, measured by the total renewable freshwater resources per capita, is significant in the Arab region, with 13 Arab countries facing absolute water scarcity, 5 countries facing water scarcity and the remaining 4 countries being above the water scarcity level in 2014 . On the other hand, at least 90 percent of 13 Arab countries’ populations are using improved drinking water resources and 12 countries’ populations are using improved sanitation facilities in 2015. The relatively insufficient and overexploited water resources, variable climatic conditions and deforestation are playing an important role in aggravating desertification in some countries of the region. Energy resources are quite abundant in the Gulf region driving the CO2 emissions high and the prices of the national oil products low. The highest CO2 emissions per capita in the world were recorded in Qatar in 2014 at 43.9 tonnes of CO2 per capita, while 6 out of the top 10 highest CO2 emissions per capita countries originated from the Arab region . Additionally, the Arab region's total energy production amounted to 1,776 Mtoe in 2014, with only 4 percent deriving from renewable energy sources, Sudan has the largest renewable energy production at 10 Mtoe . The impact of the consumer behavior – that is based on the advanced marketing techniques that encourage the utmost consumption of goods and services regardless of the products and services’ sustainability— has been manifested in the Arab region in the past few decades by significant environmental concerns, mainly desertification, high CO2emissions and deforestation for the purpose of expansion. The main environmental problems, in addition to the unsustainable energy consumption behavior and the limited attention that governments are giving to environmental protection in their national strategies, are leading to an increase in the overall air, water and waste pollution levels in the Arab region, in addition to the unsustainable depletion of the available natural resources. This overview has been drafted by the ADP team based on most available data as of 05 March 2018. 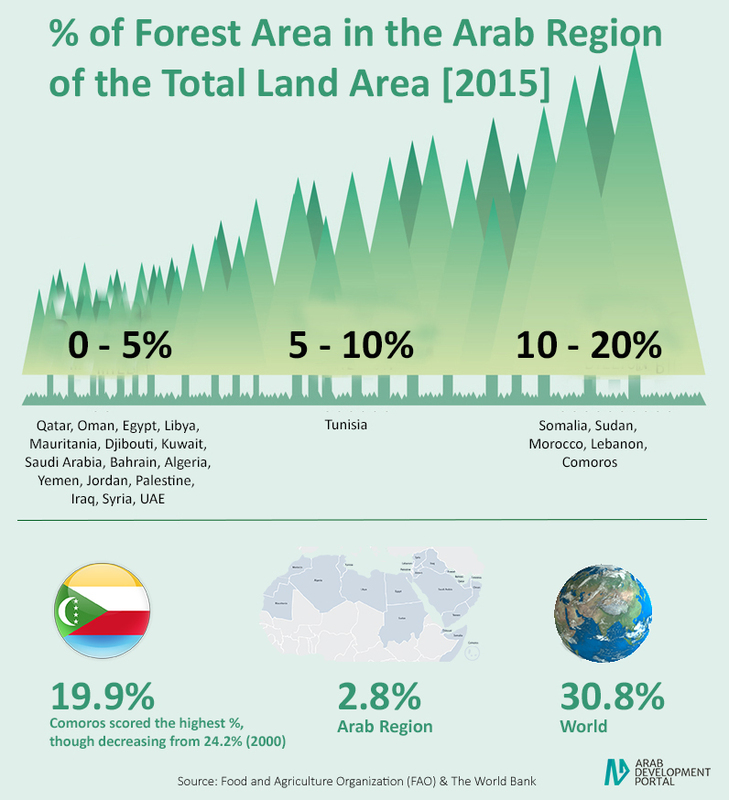 Comoros scored the highest % of forest area of the total land area (2015).